Cancer survivors don't need a month-long reminder punctuated with ubiquitous pink ribbons. We know. We can't forget. It's nice and all, thank you, with everyone driving around with the stickers on their bumpers, and running/ walking for the cure, donating, speaking out, sharing their stories. But we survivors don't need the brain rush at the grocery check-out to pledge a dollar. Because we know how important it all is. We wish we didn't have to know, but we know. I swore I would not be one of those cancer survivors who counted out the days from diagnosis, and wore my mortality on my forehead. I cringe at the thought of a support group, going over and over and over it again and again. Because frankly I want to get as far away from it as I possibly can. It's been four years and the throat-closing panic is only just a little bit softer. A little bit tamed. I wonder how far out from the diagnosis I am and how much closer to the next eruption. The glass is half full one way and half empty in the other view. It's just half is all. I don't think I am alone in this. Last week I had my semi-annual with my radiologist, Dr. Joan Werber. She is always kind and compassionate and has the most wonderfully zen offices that feel like the waiting room of a spa. It even smells good. The colors are warm, the staff understanding, but as I know, everyone seems nice on the safe side of cancer. She asks me about the boys, about work, about my life. How I am doing I feel completely matters to her. And she to me. "When will I stop panicking every time I come here?" I asked her after she gave me the OK that everything was fine, I was clear. She put her hand on my back and said, "You never will. But you make peace with it." It was a good answer. I don't need or want a bubbly pink retort cheerleading me to positivity. I want someone to understand what it means to wake up in the morning, drive there to her offices with such dread and fear that I can barely change lanes in traffic. It takes too much energy. And then I walked across the hall to the surgeon's office for my ultrasound of the cancer site. It's a fairly recent arrangement, this office proximity and it makes a world of difference. No reparking, no long wait of weeks between appointments. Back to back. Less anxiety, you get it all done in one morning or afternoon. And then you can go back to your life. Dr. Kambiz Dowlat is another source of calm reassurance. His staff knows my name. They even have good magazines in the waiting room. We exchange pleasantries and he asks direct questions about my sons, my books, my work at Northwestern University. He knows me. I am not just another case to him. I am a person who does not want to die. Because I can't die. I have three sons. And I am it. I feel a little better this week, the anxiety has lifted; I have no cancer. Now. But, yes, I have no cancer. 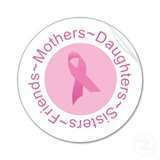 The pink ribbons remind me of the millions of women like me who share this history, this present, this future. And I know I am lucky, luckier than those who are no longer here. And I do celebrate my extraordinary fortune. And I sympathize and mourn the loss of good women struck down. As a member of the cancer sorority, I want to keep moving forward, keep living my life as a mother, sister, friend, partner, mentor, corworker without that drumbeat playing in my head. The one that reminds me where I have been and where I could be again. It would be dishonest to say otherwise. I think about cancer a lot. I do eat well, live well, sleep well and pray more than your average person. I must say when October ends and November begins, I am a bit relieved. I don't really need billboards and commercials shouting at me to remember breast cancer. I never, ever forget.